The first group of peacemakers trained by the Rhineland Church. Whether internal or international, violent conflicts are currently getting an increasingly high profile in the media, says Maren Voigt. The 21-year-old from Leverkusen went on to state “Therefore it is also important in respect of German military deployment to consider our position and to deal with the alternatives to violence.” After spending time with the voluntary peace service in Togo, she has been undertaking training as a “Peacemaker” (note: the English term is now officially used). 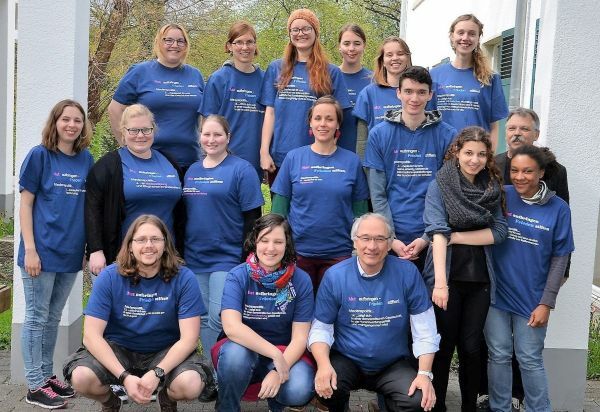 Around fifteen 20-year-olds took part in this first training course organised by the Hackhauser Hof Protestant Youth Training Centre in Solingen together with the Protestant schools and youth work of the Rhineland Church. While in Solingen they then received their certificates presented by Revd Anja Vollendorf from the Church Office. Over two weekends involving a practical seminar lasting for several days followed by a closing conference, the graduates of the course engaged in an analysis of the interests of the various participants in war and in testing out the options for non-violent conflict resolution, amongst other issues. In addition they engaged in conversations with refugees and peace activists. The participants include students of electro-technology, pedagogy and teacher training. They are voluntary workers involved in social education. Both as professional and voluntary workers with young people they are able to offer their experience of engaging with non-violent conflict resolution. “With this we aim to offer an alternative to the current activities of the Federal Armed Forces in schools”, says Wilfried Drews, who works as an instructor at the Hackhauser Hof with responsibility for training. He says that the fact that since the ending of compulsory military service army officers have increased their advertising of careers in the armed forces among schoolchildren is a real problem. “This contradicts the UN Convention on the Rights of the Child, which has been signed by the Federal Republic, according to which underage children are not allowed to be recruited for military operations.”. Mr Drews explained that according to the Beutelsbach consensus agreed with the Central Office for Political Education in the 70s, it is not allowed to indoctrinate schoolchildren with particular opinions. “It is more a case of enabling them to develop their own opinions through the assistance given by education”. So it was that in 2012 the project group “peace education and conscience formation” was commissioned on behalf of the Evangelical Church in the Rhineland to develop concepts which would offer young people the possibility of gathering information for themselves and forming their own opinions. One of the measures that was taken, among others, was the training as peacemakers, started in 2016. “As a young person I was already actively involved in youth work and I profited a lot from activities outside school,” said peacemaker Maren Voigt, “And so I know for myself how important and formative peace education can be.” What are our experiences of war and peace? And what does peace actually mean? Sharing thoughts on these and other questions was one of the things she found very rewarding during the training course. “There are very different ideas on this and I find it important to consider the different perspectives and to take them seriously.” One of the things that excited her was when peacemaking methods were first tried out in role-play at the seminar, and then followed up with discussion. You can’t just see everything as black or white, since there are no simple solutions such as those portrayed in the propaganda surrounding military interventions, in the view of Wilfried Drews. And so the content of the peacemaker education training includes an analysis of the course of conflicts, taking a close look at the positions of the parties involved and looking at non-violent solutions. Representative of the Green Helmets and of Amnesty International were invited, along with peace activists in Israel from the World Council of Churches and people who had fled from the violence in Syria. In the view of Mr Drews Germany is involved both directly and indirectly in conflicts around the world, either militarily or through arms exports. In order to work with young people in dealing with this topic, those employed in youth work needed to have specialist information and expertise. Therefore a further training course is planned for 2018.